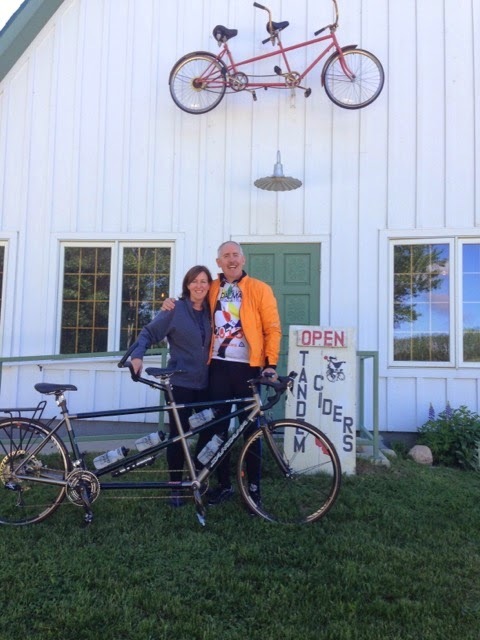 Gary and Nancy purchased their Santana Beyond tandem bicycle from the Century Cycles store in Medina. They report that they've ridden about 420 miles on it so far, and are "pretty darned happy with it." They came across this place, Tandem Ciders, a winery and cider-making shop in the Leelanau Peninsula are of northern lower Michigan. Thanks for the update, Gary and Nancy, and we're glad you're enjoying your bicycle! Thinking about trying out a tandem with your significant other? Our Medina store is Ohio's only authorized Santana Test Ride Center. We've got several Santana tandem bicycles in stock, and several of our staff are expert tandem owners and riders themselves! Stop in and take a look!